TH E M R EP O RT | 43 O R I G I NAT I O N S E R V I C I N G DATA G O V E R N M E N T S E C O N DA R Y M A R K E T ORIGINATION THE LATEST Risk Low, Quality High on Recent Originations CoreLogic report shows Q3 mortgage loans were at their highest quality in 15 years. F or mortgage originations, things are beginning to look a lot like they did before the bubble—at least when it comes to credit quality and risk level. CoreLogic's Housing Credit Index (HCI), which measures risk attributes such as credit score of the borrower and DTI and LTV ratios, found that the mortgage loans originated in the third quarter of 2016 were not only less risky than those originated in the same quarter in 2015, but were the highest quality of originations in 15 years. "As the U.S. entered its eighth year of economic recovery this past summer, we continued to see mortgage origina - tions with relatively low credit risk," said CoreLogic Chief Economist Dr. Frank Nothaft, "and this pattern will likely con- tinue into 2017." The average borrower credit score for loans originated in Q 3 2016 jumped by 5 points year-over-year, from 734 to 739, ac - cording to CoreLogic. The average borrower DTI fell from 35.7 to 35.4 over-the-year in Q 3, and the average DTI dropped from 86.8 down to 85.6, according to CoreLogic. The percentage of borrowers with credit scores of 640 or less had declined by three- quarters compared with 2001, CoreLogic reported. For the lowest 1 percent of borrowers with home purchase loans, the average credit score increased from a range of 490 to 510 up to 622 to 624 in the third quarter of 2016. "The index incorporates six risk at - tributes, including the three Cs of under- writing—credit, collateral, and capacity," Nothaft said. "Using 2001 originations as a base year, the HCI shows the significant loosening of credit running up to 2006. This was followed by a dramatic tightening of credit in response to the real estate crash and a decline in high-credit-risk applicants beginning with the Great Recession. 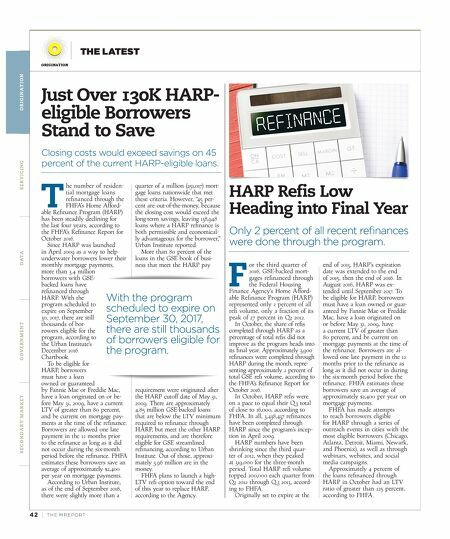 While low-down payment and high payment-to- income products are available today, bor - rowers generally need good credit scores to qualify. This may be a factor that has led to the drop-off in applications from those with lower credit scores during the last few years." Many Lenders Unhappy with Current LOS More than half of lenders surveyed are dissatisfied or looking to replace their current loan origination systems. 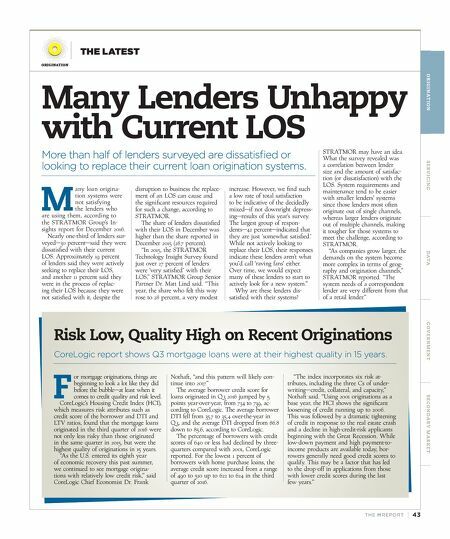 M any loan origina- tion systems were not satisfying the lenders who are using them, according to the STRATMOR Group's In- sights report for December 2016. Nearly one-third of lenders sur- veyed—30 percent—said they were dissatisfied with their current LOS. Approximately 19 percent of lenders said they were actively seeking to replace their LOS, and another 11 percent said they were in the process of replac- ing their LOS because they were not satisfied with it, despite the disruption to business the replace- ment of an LOS can cause and the significant resources required for such a change, according to STRATMOR. The share of lenders dissatisfied with their LOS in December was higher than the share reported in December 2015 (28.7 percent). "In 2015, the STRATMOR Technology Insight Survey found just over 27 percent of lenders were 'very satisfied' with their LOS," STRATMOR Group Senior Partner Dr. Matt Lind said. "This year, the share who felt this way rose to 28 percent, a very modest increase. However, we find such a low rate of total satisfaction to be indicative of the decidedly mixed—if not downright depress - ing—results of this year's survey. The largest group of respon- dents—42 percent—indicated that they are just 'somewhat satisfied.' While not actively looking to replace their LOS, their responses indicate these lenders aren't what you'd call 'raving fans' either. Over time, we would expect many of these lenders to start to actively look for a new system." Why are these lenders dis - satisfied with their systems? STRATMOR may have an idea. What the survey revealed was a correlation between lender size and the amount of satisfac - tion (or dissatisfaction) with the LOS. System requirements and maintenance tend to be easier with smaller lenders' systems since those lenders most often originate out of single channels, whereas larger lenders originate out of multiple channels, making it tougher for those systems to meet the challenge, according to STRATMOR. "As companies grow larger, the demands on the system become more complex in terms of geog - raphy and origination channels," STRATMOR reported. "The system needs of a correspondent lender are very different from that of a retail lender."